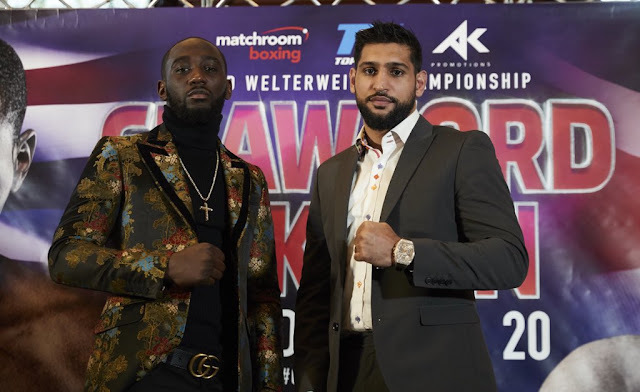 Terence Crawford will be defending his WBO welterweight world title against Amir Khan (33-4, 20 KOs) at the Madison Square Garden on April 20th. The promoter Bob Arum preferred Madison Square Garden over MGM Grand Garden Arena in Las Vegas as the site for Crawford Khan, which will be televised by ESPN Pay-per-view. British fighter Amir Khan will be making his debut at the Arena, while the three-division champion Crawford (34-0, 25 KOs), who’s promoted by Arum’s Top Rank Inc., has headlined a card apiece at Madison Square Garden and The Theater at Madison Square Garden. The official announcement of the site will be made soon, when the prices are set and announced. Amir Khan had options of facing fellow Brit Kell Brook (38-2, 26 KOs) in a lucrative fight but opted for Terence Crawford, who had a World Title to offer for the match up. Crawford, also had to choose between former WBA welterweight champ Luis Collazo (38-7, 20 KOs) and Khan.